Summer in Italy is hot, there are no two ways about it. We go every year and we always find scorching temperatures. Rome is a nightmare in July and August and last year in Florence we even caught a heatwave that got temperatures to rise well above 40 degrees C. To give you an idea of how it felt, I’ll tell you its name: heatwave Flegeton, Dante’s Infernal river made of hot lava! Such heat must never be underestimated and especially with a baby it calls for extra precautions. Here are some ideas on how to fend off the heat if you are planning to spend the summer in Italy with baby. Disclaimer. Please note: I am not a doctor nor a health professional. These are parent-to-parent suggestions: alway speak to a professional before travelling, especially if to an unfamiliar climate. This post was originally published in the summer of 2015 and has now been fully updated. I know you have probably chosen Italy because you want a family vacation in the sun but you need to respect our closest star and its power. Stay out of the sun at least during the hottest hours of the day, between 11 am and 4 pm, longer with a baby. Venture out early morning, late afternoon and evening: this is what Italians do and you might be surprised to see how many parents with prams and buggies are out well after what might be considered baby’s bedtime. This applies also to toddlers and playgrounds, especially in holiday destinations, are a popular evening hang-out for families. Baby skin is very delicate and it needs protection from the sun in the form of shade and sunscreen. Meaning well, you might be tempted to cover them head to toes with it, but don’t: sunscreen can make perspiration more difficult and some of the components might irritate baby’s skin. Ask your doctor about the right product for each age and how much and how often to use it. Only bring on holidays products already tested and proved safe on your baby: the last thing you want is an unexpected reaction, allergic or otherwise, while abroad! Like sunscreen, oils and lotions might prevent perspiration: use them with caution and ask your doctor to make sure baby’s lovely pre-sleep massage does not become cause for skin rash. Choose natural fiber, loose fitting clothes that allow healthy perspiration and check often: touch your baby’s skin to check temperature, change clothes often especially if they get soaked in sweat and, within reason, take nappies off if you can for at least part of the day (this can be done even just with prolonged changing sessions). 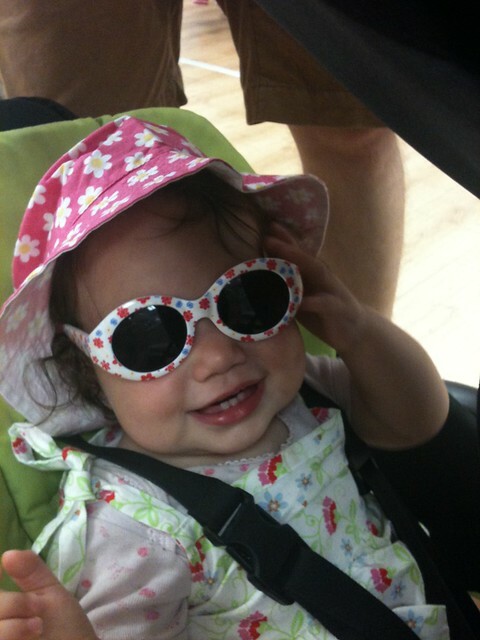 Make sure baby always wears a sun hat and sunglasses. This is my daughter in her summer outfit, before she decided she is not a girlie girl!! a good choice for summer, but even with it, check regularly to make sure the outside heat and the body contact do not make baby uncomfortably hot. I find many strollers are made of poorly breathable material: if you have one of those and do not want to spend on a new one, I find putting a lightweight towel on it as an extra layer between baby and pushchair an easy, practical solution. In hot weather children might be less hungry but make sure they get their fluids in: if you are breastfeeding, this might mean very long sessions with your baby – the good news is that I found Italy, overall, very accepting of breastfeeding so you don’t necessarily have to retire to your room to do it. If you are formula feeding, you can stock up in supermarkets or, sometimes, in pharmacies: in Italy many baby products are sold at the chemist rather than the general store, so check both. Do not take air conditioning for granted: its use it is not as widespread and even hotels with air-conditioned rooms might have it at a setting that you might perceive as not cold enough. I am making this point especially for my American friends: every time I go to the US I catch as cold as I feel American air conditioned places as freezing (this is the running joke with my husband, who grew up Ireland and has a very different perception of heat!). Looking at it from the other side, I know Italy’s air-con can be perceived as inefficient: my advice for this is to ask your hotel (or apartments) to confirm what cooling system they have and that you will have full control of its functioning. Be very cautious with air conditioning and baby and always follow safety guidelines for safe room temperature and cot positioning. Italian buildings usually have shutters and they are a life saver in the summer. When you leave your house or hotel room, to make sure it doesn’t become a super hot greenhouse, do like the Italians: close the persiane (shutters) but leave the glass windows open. This way the house, upon your return, will be well aired without having been exposed to the sun. If at all possible, escape Italian cities in the summer and do like the locals: go to the beach or the Lake! With kilometers of coastline, most cities are sufficiently close to the sea to allow for easy escapes or even just day trips. Summer in Italy with baby is best enjoyed away from the city! If you want to escape the heat of Florence, try got to the hills around it (even just Fiesole, a stone throw from the city). From Rome, consider the coast (Sperlonga is lovely) or the lakes (Martignano, Bracciano). From Milan, head towards lake Como and in the south just head towards the beach. near Palermo, we loved Scopello. Unless you are really short on time and a strict agenda, chances are the detour will be worth it both health and sightseeing wise! If you can’t leave the city, seek out a pool: in Florence we found many lovely ones that helped us fend off Flegeton! Before deciding on your activity for the day, make sure it will not force you and baby to endure crazy high temperatures: archaeological sites tend to get very hot and with little shade and museums do not always have air conditioning – check each time. Ask your doctors for medications and remedies should your baby not react well to the heat. The American Academy of Pediatrics or the NHS website (UK) can provide information but nothing can replace professional personalised advice! What is the weather like where you live? Do you like hot summers or do you prefer to escape to cooler climates, on holidays? I’d love to hear your experience and if you have any additional tips to survive the heat or make the most of your summer in Italy with baby in tow, please share them in a comment! Are you on pinterest? If so, follow my Amazing Italy pinterest board with advice about family travel in Italy and vacation ideas in Italy.